First run w/ a 6.5 hv and RX8, .... it is a great track set -up. Plenty of power and good run times. Temp's are 130deg after 15 min of hard running. Using about 225mah per min. Giving me a max of 20 min on my 5250 MAx Amps 2s. The SCRT10 will be my new rig for outdoor next year, .... just need to make some changes and uprades and it will be all ready. I run 2s 5700 and can get about 10 minutes. 20 minutes seems a bit long for my setup and track. Anyone know where to pick-up Jammin SCRT10 decals? I dont want to have to purchase a whole new body to get decals. The drive time all comes down to throttle control and gearing. The smoother you are the more run time you'll get. Really good batteries help as well. I' running a velineon 3500kv/MambaMax ESC/2S lipo in my RTR Jammin. It was fast and stayed cool. I changed to Slash rears w/Proline Calibers. Now my temps are climbing. What pinion should I use with the larger wheels/tires? Currently using the stock 13t. First time out with my jammin today was pretty fun!! One question suggested pinion size for a 10.5 540 can? I was running a 20t and burned up my stator. Is this size suitable for this truck. I am planning on getting a 4.5 hv soon. Thanks i am new to the whole electric racing side of this hobby. 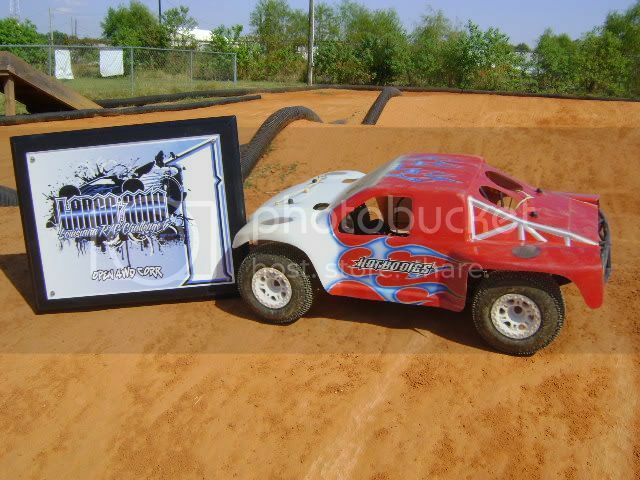 I really only race eight scale and this truck is a blast!! Oh no that's not at all normal, ...... your using 625 mah per min. Average is sround 225-250 , high would be about 300-325, max 350. Something is way wrong. hey, i won this weekend too with my jammin! Do you have a pic with the body off...let us know your setup. All times are GMT -7. It is currently 01:27 PM.